Provide a high-speed automated handling solution that would increase end-of-line throughput on smaller packs of polystyrene insulation board and enable the manufacturer to expand production to meet growing demand. Install a new line equipped with two FANUC 410iB/300 robots to unload and transfer stacks of boards. Fed by the first robot, the second robot uses its grippers to pick up the correct number of boards and, providing a sufficient number are available, sends them onto the packing machine. Easy to use, the entire set up is controlled and operated via a PC. Packing capacity has doubled, clearing a bottleneck and enabling the customer to increase production. The speed and effectiveness of the robots has reduced cycles times and compressed three shifts into two. What very few readers would still know is that Isomo stands for ISOlation Modern. It is a well-known brand of expanding polystyrene polystyrene plates and in Belgium a generic type name is called Styrofoam. The production operation of the Isomo plates is located in Kortrijk, it was launched in 1956 and is still under the ownership of the Vereecke. Isomo sells forty percent of its production in Belgium. Next comes France, an important outlet and a potential growth market, where the opportunities are in the small formats. This market saw quick growth last year and needed to be availed of as quickly as possible. The problem was that the existing packaging line became a bottleneck for small formats and thus was not conducive to play there and earn money. But initially the working was with man and power to do the semi-manual packing quickly, so one could tap into the new market. Since August 2011, a new robotised line has been in operation that can handle small formats quickly and profitably. Besides doubling of the packing capacity (given that this was the bottleneck, thus also the production capacity, this department could go from three to two shifts. The result is that with this investment of half a million Euro, the rising market in France translates into significant business results. Industry Technical & Management had a discussion about this new robot installation with Thierry Vereecke, managing director and Dieter Werniers, technical executive of Isomo, with Hans Van Essche, deputy director and Jelle Parmentier, project engineer of Fraxinus (the designer and builder of the new packaging line), and with Peter Kiekens and Annelies Vander Hulst of FANUC (the robot supplier). The raw material for Isomo plates is expanded polystyrene. This component is an invention by BASF dating back to the 50s, but since the patent has expired, it has been brought to the market by various companies. There are two basic types: the white pure polystyrene and the black polystyrene with black carbon inclusion. This latter has better insulating properties (also sound insulation). Depending on the final properties, additives are added in the polystyrene (e.g. for making fire-proof types). The basic product that is supplied is micro cells of the size of powdered sugar with an outer wall in polystyrene and pentane gas as blowing medium). When heating, the blowing medium can make cells expand up to fifty time4s, wherein air is sucked into the cells. That powder is expanded in a a first batch production step by injecting steam into a silo to larger hollow polystyrene beads, where the size of bead is a function of the steam that is supplied during expansion. The level of expansion that is realised in a function of the density that the future plate is to have. After an initial forced drying for a specific time, these beads are stored in storage silos for further processing. I a second step, the correct weight of beads is brought into a mould from the storage silo by air transport. These beads are again further expanded by air injection. Due to the limited volume (the mould height has a size of 6 x 1.2 m x 1 m), the expanded beads are pushed against each other and they melt together to a homogeneous block containing a lot of air (like 95% of the volume), retained within the mutually adhering, closed polystyrene bead. This block insulation material is stored on different days in the stores, until the whole reaction has completed. The third step is the cutting of that block. Three steps: First by density A broad variation of densities as function of the client and the adaption, by single mm (for insulating wall paper) to some tens of cm thick (for example for wall insulation). Mostly one would try to maintain the same plate thickness for handling or restrict to the maximum three thicknesses. Consequently in the desired width (width is normally 1.2 m or 1 m and since recently 0.6 m). At the last work post, the correct lengths are cut, earlier mainly lengths of 2 m, now also increasingly a variations of lengths from 33 cm. This curring is done mechanically using pres tressed copper wires, which are heated using their electrical resistance. One thus melts the taut wire through the block, simultaneously sealing the cut layer and giving a smooth surface. Setting of the position of the wire is done manually. The blocks go via a controlled transport conveyor through the three work posts and are automatically cut. The next step is packing. Earlier, the plates were mainly of 2 m length (often used as cavity wall insulation), and for packaging these (with a plastic film to facilitate carrying a number of plates); by the end of 80s, a machine was purchased. The cut blocks are transported using a transport belt to the packing machine. The plates are unloaded there and placed on the foil machine manually; the foil is wrapped around it and welded. The packets are them manually picked up and placed on the pallet. France was an important market for do-it-yourselfers, requested by the smaller plate sizes and smaller packages. Adjustments such as renovation and wall insulation also use smaller plate sizes. Where one pulled out a cadence for the large plates of 60 sqm/ hour, this speed decreased for small plates to only 30 sqm/ hour. This ensured that the cutting machine had to mostly rest. In other words, the complete production output dropped too drastically and the cost price of the small formats became too high, so one could not calculate the sale price. In order not to allow this market to lie low, it was decided by end of 2010 to set up a specific line tor the smaller formats. Via Desco, the supplier of the first packaging machine which was found very satisfactory, ISomo came in contact with Fraxinus. He designed and built, based on Seco packaging machine, a robot installation with which one could pack three thicknesses together. 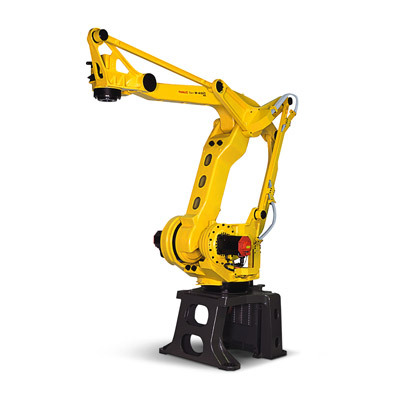 The new robot line has two robot positions, both fitted with a FANUC-410iB/ 300 robot (maximum joint load 300 kg). The robot choice is also determined by the maximum weight, the work area and the various forces that must act on the robot. The cut packages, consisting of various stacks one after the other, each with a number of plates (where the plate thickness can differ), are fed from the cutting machine to a transport conveyor. In the first robot position, they are transferred stack by stack unloading position.on a succeeding conveyor, which brings the stack up to the unloading position. The robot picks up the correct number of plates using its gripper and sets them down on the roller track to the packaging machine. If the number of plates of the thickness provided on the stack is less than the quantity that is in the packaging, the robot deposits them at one of the waiting positions. If there are sufficient plates of this thickness for a pack at a specific waiting position, the robot sends that packet from the waiting position through to the packing machine. It goes on the roller track to the foil machine, where the packet is wrapped up in film and the foil is tightly sealed. The cycle time of the packing machine is eight seconds. It was purposely not chosen to shrink wrap to be sure that the thermo insulating plates are not damaged (they may melt under the higher temperature). The packed plates go on the roller track to a second robot that ensures stacking of the packs according to the desired pattern of the appropriate pallet. Up to three different thicknesses can be processed and thus can be stacked on three different pallets. Between the two robots there is device to print labels and to attach them, so the package is labelled appropriately. The whole is controlled and operated from a PC. The PC supports, via Ethernet, the label printer, the robot controller, the controller of the packing machine and the PLC (Siemens S7) which operates the rest from the line. The PLC actuates the pneumatically working grippers, as well as the supply conveyor belt and discharge roller tracks. The roller tracks are both driven with SEW geared motor and chain drive to the rollers; its speed is controlled from a Lenze frequency control which communicated with the PLC via Profibus. The grippers are specifically custom developed by Fraximus. They have a double gripping system, on one side two side walls that are pressed against the Isomo plates and in the gripper walls there is an additional set of needles that are pressed into the plate (so that they do not slump as a result). The operation of the side walls and of the needles takes place by some help from pneumatic cylinders (Festo). There was the option to have this operations take place via servo spindle axis. The advantage was that one could integrate as sixth axis in the robot control, but the cost would have been very high, certainly because the regular margin would have to be very low (there are 2 block widths today 100 and 120 cm). Fraxinus was contacted in December 2010. Based on the first designs of the robot line (so still one plate thickness per block) Isomo placed the order in January 2011, It was decided at the time of detailed design to increase the flexibility by allowing up to three thicknesses per pack. In March, the actual construction could be started. The installation on site was done in two parts. The first part - with the destacking robot and the packing machine - were put into service on 6 June 2011. Stacking was still done manually on pallets, but the actual wrapping went off pretty quickly (useful because June is a busy month). The end piece, the stacking robot, was put in standstill in August 2011 and successfully started up. The gain in speed on the packaging line is big, with this line one can manage 60 m³/hr and for some types up to 80 m³/hr, thus twice as much as earlier. The night shift can thus be dispensed with.